Have you ever been in charge of Thanksgiving dinner? It can be a mad rush to get all the side dishes and the turkey ready and timed exactly right. That’s why I’m a huge fan of using a slow cooker for anything you can. The slow cooker really gives you the flexibility to serve dinner when you’re ready. If the dish made in the slow cooker is done cooking early, simply turn the slow cooker to warm and serve when everything else is ready. It keeps the food hot and ready when YOU are. Thanksgiving would not be complete without stuffing! 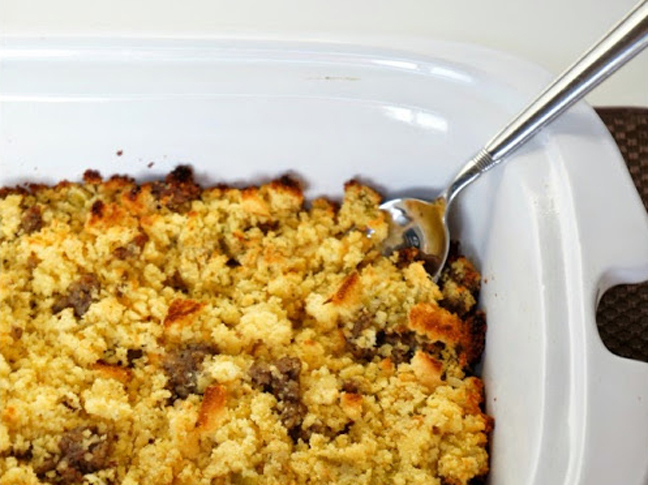 Cornbread stuffing with sausage is a must. Instead of using a bunch of seasonings why not make a cornbread ranch stuffing by using a packet of Hidden Valley® Original Ranch® Salad Dressing & Seasoning Mix? It’s super flavorful, and you get that ranch flavor that we are all a fan of! Step 2: When you're ready to make the stuffing, heat large skillet over medium high heat. Crumble the sausage into the heated pan and brown well. Remove the sausage from the pan and add to a large slow cooker. Now, melt the butter in the large skillet on medium heat. 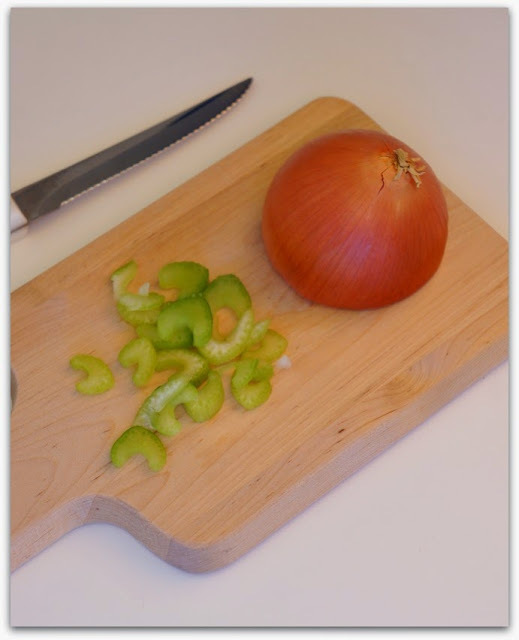 Add onion and celery; cook and stir 5 minutes. 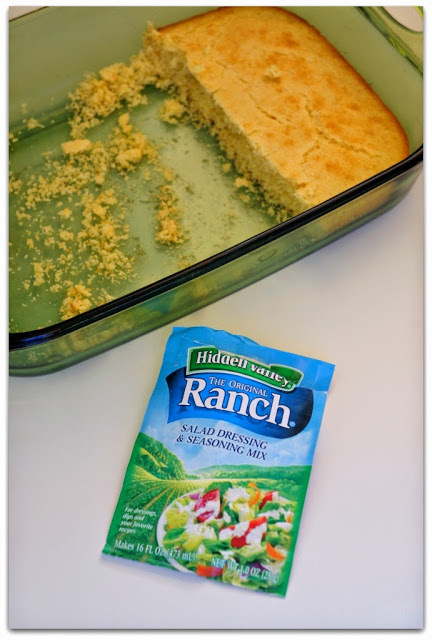 Stir in the Hidden Valley® Original Ranch® Salad Dressing & Seasoning Mix. Add the vegetable mixture to the slow cooker. 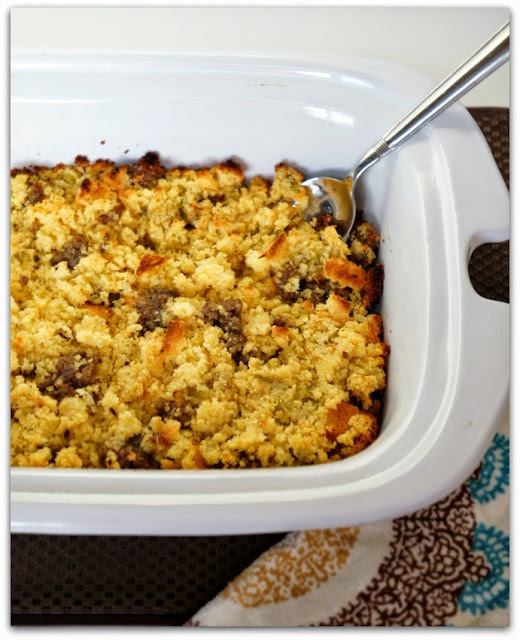 Step 3: Crumble cornbread into large, coarse crumbs. You'll need 10 cups of crumbs. This will use about ¾ of the pan of cornbread (sneak the other pieces for a little snack). Add the 10 cups of crumbs to the slow cooker. Step 4: Gently fold the cornbread, veggie mixture, and sausage in the slow cooker. Add the broth and toss gently to mix. Step 5: Cover the slow cooker and cook on LOW for about 4-6 hours or on HIGH for 2-3 hours. Remove the lid and gently stir a bit. If a browner top is desired, place slow cooker insert into an oven that has been set to broil. Brown for just a couple of minutes under the broiler. (I keep the oven half open so I can watch it carefully.) Remove from oven and serve. 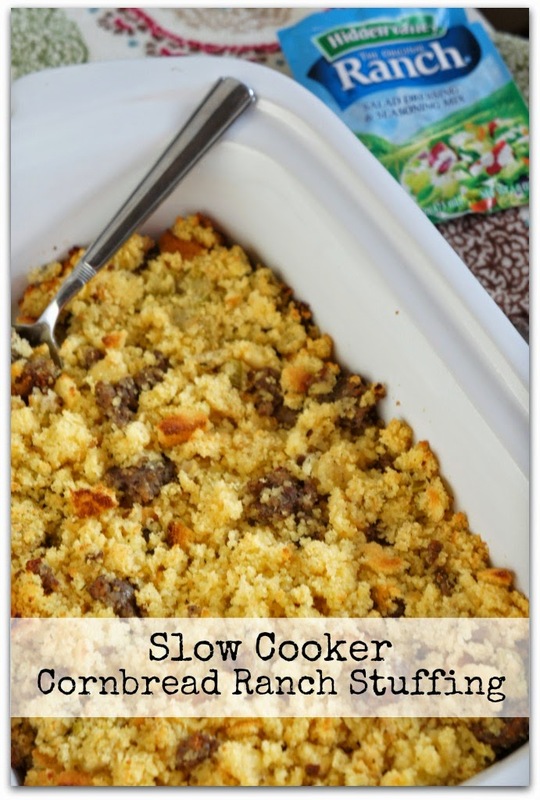 Note: This recipe can be kept in the slow cooker on warm for up to 3 hours. This post was sponsored by Hidden Valley.